Becoming a Certified ProAdvisor has given me the ability to not only move my business to the cloud and service my Victorian clients, it has enabled me to expand my business to Perth, Queensland and Adelaide too! When I commenced my business back in 2005, there was no way I thought this was possible; I was only thinking about servicing local clients as I was visiting many in their offices. Today my business has expanded beyond offering bookkeeping services to include training of the business owner. This is the result of QuickBooks Online being very easy to use and the business owner wanting to do the bookkeeping themselves. The thing is, when I deliver training, the business owner thinks he is simply being trained to use QuickBooks Online, however I take the opportunity to show them how to use QuickBooks Online as a tool to for business processes, internal controls and proper cashflow and financials. By becoming a Certified QuickBooks Online ProAdvisor I was able to get the training, resources and tools I needed to deliver these services in my business. Plus, having the certified ProAdvisor logo in all my business materials and advertising, gave me credibility in being an expert in QuickBooks Online. Intuit invests a great deal of money and resources towards driving small business customers to their website to connect with ProAdvisors in the Find a QuickBooks Online Expert listing. And having that (free) exposure to small businesses on the Intuit Website as an expert is marketing gold, making me visible to potential new clients. To get your practice in the ProAdvisor listing, log into your QuickBooks Online Accountant, then click on the Gear icon at the top right. Then click on Accountant Directory Profile then Edit Profile. Next, add a bit about your business, your details, the services you provide and of course, your picture or your logo. When you’re ready, click Publish to make your profile visible to the world! 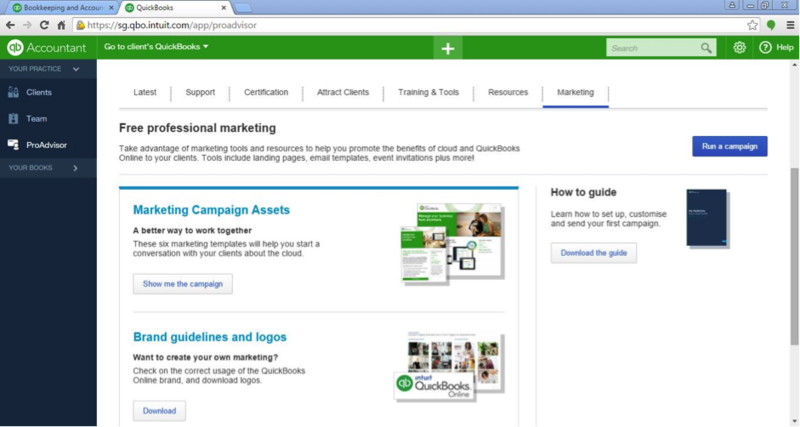 Another great benefit about being a QuickBooks Online ProAdvisor, is access to the ProAdvisor Partner Portal where you have tap into a range of marketing materials to help promote cloud accounting to your clients. For example, under the Marketing tab, you can use send out ready-made email campaigns. All you need to do is add your logo and details to the campaign and shoot it out to your database. If you need more information about what’s available in the ProAdvisor Partner Portal, contact your Account Manager or the support team on 1800 618 521.